Strawberry rhubarb pie: A summer classic! A little tart and a little sweet, this strawberry rhubarb pie is dead simple to make and a super simple pie dough just takes it all right over the top. I’ve had a prejudice against pies for years. Admittedly, a pie maker I’m not. I can’t pinpoint the reason for this prejudice but it’s been lurking around my kitchen. Lurking like your slightly off-kilter college roommate does when your suite is brimming with friends. And like this college roommate situation, it’s unnerving. I want to make pies. I’ve seen some jaw-droppingly gorgeous pies around the blogs for years and yet each summer passes by without the sign of a pie on Smells Like Home. I’m sorry that I’ve been a wimp. I’m working on it! This strawberry rhubarb pie is the first plunge I’ve taken into pie making this summer. I hope you like it. I loved it!! I pulled the strawberry rhubarb filling together in about 5 minutes and the dough took even less time to make. The pie dough was shockingly easy! Not ever having had rhubarb, I wasn’t sure what to expect from the flavor but it blended so beautifully together with the strawberries – a little tart and a little sweet with a pie crust that made me burst with pride when I took my first taste. Judging by my 92-year-old grandmother’s ecstatic reaction this pie, and considering she has vivid memories of slimy rhubarb that her mother used to boil to all hell, I’d say that this pie is a resounding success. I’ve invested in a pie cookbook to assist me through the summer and after this strawberry rhubarb triumph, there will definitely be more pies coming soon! To make the pie dough: Combine the flour, sugar, lemon zest, and salt in the bowl of a food processor fitted with the steel blade. Pulse briefly to blend. Add in the butter pieces and pulse a few times just until the butter incorporates into the flour, the mixture resembles coarse sand, and the largest butter pieces are not much bigger than peas. Add in the cold water through the feed tube and pulse just until the dough comes together. Shape the dough into a ball, wrap in plastic wrap and chill in the refrigerator for at least 30 minutes. (This dough can be frozen for up to 2 months.) Remove from the refrigerator. If you’ve increased the recipe by half to make the star shapes, cut off 3/4 of the dough and proceed with the next step with the larger piece of dough (wrap the smaller piece of dough back up and refrigerate). Roll out the dough on a lightly floured work surface into an approximately 12-13 inch circle. Gently transfer the dough to the pie plate, laying the dough onto the bottom and up the sides – do not press the dough into the dish. Allow the edges of the dough to hang over the rim of the plate. You may need to trim off some of the dough to even it out. Using your fingers, crimp or flute the edges of the dough with your fingers. Transfer the pie plate to the refrigerator while you make the filling. To make the filling and assemble the pie: Whisk together the sugar, thickener or flour, and salt. Roll out the remaining dough from the refrigerator, and cut it into star shapes. Arrange the stars atop the filling. Lightly brush the stars with water and sprinkle with coarse white sparkling sugar, if desired. Bake the pie for 30 minutes then reduce the oven heat to 375°F and bake for an additional 35 to 40 minutes, until the filling is bubbling and the crust nicely browned. If you have a stainless steel crust cover, place it on top of the crust after 20 minutes to prevent the crust from browning too much. Remove the pie from the oven, and let cool for an hour or so before serving. I have a prejudice against pies too, don’t know why either (well, maybe it has something to do with black smoke many years ago). My son is requesting one of these since I have attempted to stomp out my fear of pie making…. I think this pie is beautiful and I love strawberry and rhubarb together. I’m with you, I am slightly intimidated by pie but I have declared this summer, “The summer of pie”, so we will see!! Gorgeous pie, Tara! I think you’ve mastered it! Simply gorgeous, Tara! I’d say you’ve mastered pie! 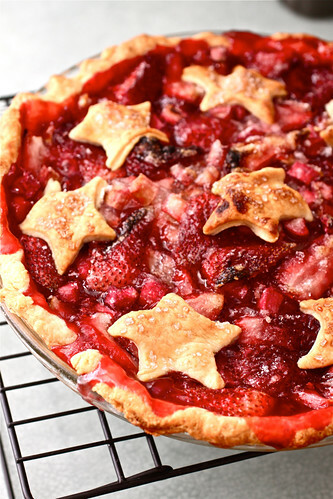 That is a gorgeous looking pie… love the Stars! You have definitely conquered “pie-phobia”! it is beautiful and looks delicious. I’d like a piece right now – all warm with a scoop of vanilla ice cream, YUM!